Most modern digital cameras are equipped with advanced autofocus systems that are often hard to understand. Whether you are shooting with an entry-level or professional camera, knowing how to use autofocus system effectively is essential to get sharp images. A badly-focused, blurry image can ruin a photograph and you cannot repair it in post-processing. Some professionals often end up converting their images to black and white, to hide their focusing problems. If you learn how to focus correctly, you do not have to resort to such measures and you can deliver much better results to your clients and family. Simply put, accurate focus translates to sharper images and that is something everyone is looking for in photographs today. I know some photographers will argue with me on this, saying that sometimes image blur yields a “creative” look, but it is one thing when you do it on purpose and another, when you consistently mess up just because you don’t know how to focus well with your camera. Once you learn how to properly focus with your camera, you can then decide whether you want to blur something on purpose. In this article, I will teach you everything I know about focus modes on modern DSLRs. Since autofocus functionality depends on what camera type and model you are using, I obviously cannot go over all available AF modes, so I will only go through a couple of examples. Since I am a Nikon user, I will put a little more emphasis on Nikon DSLRs. Please note that this article is for more advanced DSLR users, since I go through each mode in plenty of detail. The nice thing about digital cameras today, is that you do not have to manually focus like people used to before, back in the early film days. Digital photography is much more forgiving in this regard, because unlike film, you can see the results instantly and you can easily change your camera settings and take many exposures without worrying about film cost and replacement. Autofocus has gotten better and better over the last decade and even the cheapest entry-level DSLRs are now equipped with rather complex autofocus systems. So, how do the modern camera autofocus systems work? Let’s go over a few basics. There are two types of AF (Autofocus) systems – Active and Passive. The “Active AF” system works by shooting a red beam on your subject, then bouncing that light back to your camera to figure out the distance between the camera and the subject. Once the camera knows what that distance is, it instructs the lens to adjust focus based on this information. The nice thing about Active AF, is that it can be used in very poorly-lit environments, where normal (passive) AF does not function. The bad thing about Active AF, is that you can only use it for stationary, non-moving subjects and it only works for close subjects within 15-20 feet. If you use a Nikon or a Canon speedlight that has an “AF Assist” function, it will use an Active AF system. On the other hand, the “Passive AF” system works very differently – instead of relying on the red beam to find out the distance between the camera and the subject, it either uses special sensors within the camera to detect contrast from the light that goes through the lens (known as “Phase Detection”), or uses the camera sensor itself to detect contrast in the image (known as “Contrast Detection”). What does “detect contrast” mean? Without going into complex terminology, this simply means that it tries to look for sharpness in a particular part of an image. If it is blurry, the AF system will adjust the lens focus until sharpness/contrast is achieved. That is why the Passive AF system requires that you have enough contrast in your frame for it to be able to focus properly. When a lens starts to “hunt” for focus on single color surfaces like white walls or gradient/blurry surfaces, it happens because the camera needs objects with edges (contrast) that stand out from the background to be able to acquire focus. If you would like to find out more about this subject, see my detailed article on Phase Detection autofocus. By the way, if your DSLR has an “AF Assist” lamp in front of the camera, it is not an “Active AF” beam – all it does is fire direct light at your subject like a flashlight would, so it still relies on your camera’s “Passive AF” system. Many digital cameras such as point and shoot cameras, video cameras, etc. often use the “Contrast Detection” AF method to obtain focus, while most modern DSLRs can use both Phase and Contrast Detection to acquire focus. Since the “Contrast Detection” AF method requires light to actually hit the sensor, DSLRs must have their mirrors raised in order for this to work, which means that contrast detection autofocus in DSLRs can only be done when the camera is in “Live View” mode. The Phase Detection AF is great for tracking moving subjects, while the Contrast Detection AF is great for stationary subjects. Contrast Detection is often more accurate than Phase Detection, especially in challenging or low-light situations. The nice thing about Contrast Detection, is that you can use any part of the image (including extreme corners) on your sensor to acquire focus, while with Phase Detection, you must use one or more of the focus points on your DSLR. The disadvantage of Contrast Detection on DSLRs at the moment, is that it is quite slow. I’m sure manufacturers will soon catch up with this, since the speed of autofocus while capturing videos is getting more and more important on modern DSLRs and some mirrorless cameras (particularly Micro Four Thirds) already have fast Contrast Detection autofocus. Modern high-end mirrorless cameras combine the two autofocus systems, utilizing fast Phase Detection in good light and slower Contrast Detection in low-light situations. Some manufacturers even found ways to integrate Phase Detection pixels right on camera sensors, which greatly enhances the accuracy of Phase Detection AF when compared to traditional DSLR Phase Detection autofocus. Don’t worry about all this if it sounds too confusing – the technical information above is just provided to help you understand how autofocus functions. Just remember that the default autofocus behavior on your camera relies on the light that passes through the lens and the type of focus mode you pick (as explained further down below). As you can see, Nikon D5000 has a total of 11 AF points and Nikon D300s is equipped with a total of 51 AF points – a big difference in the number of AF points. Is the number of AF points important? Of course it is – not only do you have more AF points to use while composing your shot and focusing on a particular area of an image, but also the camera AF system can use those different AF points for subject tracking (extremely useful for sports and wildlife photography). However, it is not just the sheer number of focus points that make a difference – there are also different types of focus points. Let’s talk about different types of AF points now. As I have pointed out above, the number of focus points is not the only most important factor in autofocus systems – the type of AF points is also very crucial for getting accurate results. There are two types of AF point sensors available – vertical and cross-type. Vertical sensors are one dimensional and they only detect contrast on a vertical line. Cross-type sensors are two dimensional and they can detect contrast both on vertical and horizontal lines, which makes cross-type sensors much more accurate than vertical sensors. What this means, is that the more cross-type sensors your camera has, the better and more accurate autofocus is going to be. That’s why when new cameras are announced, you will typically see something that says “x number of focus points and x number of cross-type sensors” – manufacturers proudly state the number of focus points and the number of cross-type sensors, especially when those numbers are high. For example, this is what Nikon lists under “Key Features” on the Nikon D7100: “Building on the acclaimed autofocus system from the D300s, the D7100 uses 51 focus points, including 15 cross-type sensors for detecting both vertical and horizontal contrast variations, to achieve fast, precise focus”. This means that the total number of focus points is 51, 15 of which are more accurate, cross-type sensors. Whenever you shop for a new camera, pay close attention to the total number of AF points, along with the number of cross-type sensors, because those two are important, especially if you want to shoot sports and fast-moving wildlife. As you can see, both the total number of focus points and their types are very important. However, those are not the only two things that are needed to get accurate results. The quality and the amount of light is another important factor that can seriously affect autofocus performance. By now, you probably already know that your camera autofocus works great when you shoot in daylight, under bright sun and starts to suffer when you move indoors to challenging light. Why is this the case? Because in low-light conditions, it is much tougher for your camera to detect contrast. Remember, Passive Autofocus completely relies on light that passes through the lens. If the quality of that light is poor, so is autofocus performance. Talking about quality of light – lens condition, its quality and maximum aperture are other important factors that affect AF performance. If you have an old lens with all kinds of physical problems such as mold, dirt, too much dust or back-focus/front-focus problems, your AF performance will surely suffer. In terms of lens maximum aperture, there is a reason why pro-level f/2.8 lenses focus much faster than f/5.6 consumer zoom lenses: f/2.8 is a sweet spot for autofocus systems, as the lens aperture is neither too wide, nor too narrow. Fast f/1.4 prime lenses are usually slower than f/2.8 lenses, because they require more rotations of lens elements to achieve precise focus. Precision is key at such wide apertures, as depth of field is extremely shallow. Ideally, the lens aperture should be between f/2.0 and f/2.8 for best autofocus performance. Smaller apertures like f/5.6 mean less light passing through the lens, making autofocus operation more difficult. Therefore, larger apertures are better than smaller apertures for better autofocus operation, with the exception of very fast f/1.4 prime lenses. It is also important to mention that all modern digital cameras focus while lens aperture is wide open, so whenever you change the lens aperture to a higher number like f/16, the aperture actually gets changed only when you take a picture. Lastly, the overall quality and robustness of the AF system in a camera is an extremely important factor. For example, the top-of-the-line professional Canon 1D Mark III camera designed for sports and wildlife photographers was dreaded with autofocus problems when it was released and it took a while for Canon to release firmware updates to improve autofocus performance, which angered a lot of professional photographers. Many of them ended up switching to Nikon just because of this problem. The camera was packed with all kinds of autofocus features, but AF just did not work right under certain conditions. If you are looking for the best AF systems in modern DSLRs, especially if you shoot sports and wildlife, Nikon and Canon offer the most advanced and robust autofocus systems (other manufacturers are catching up pretty quickly though). Nowadays, most DSLRs are equipped with several different focus modes for various situations. It is one thing to photograph a still subject’s portrait, and another to photograph a running person or a bird in flight. When photographing still subjects, you generally acquire focus once and take a picture. If the subject moves, you reacquire focus again and take another picture. But if you have a subject that is continuously moving, you need your camera to readjust focus automatically as you take pictures. The good news is that your DSLR has the built-in functionality to handle such situations. Let’s go over these focus modes in more detail. The “Single Area AF”, also known as “AF-S” in the Nikon world or “One shot AF” in the Canon world is a pretty straightforward way to acquire focus. You pick one focus point and your camera will look for contrast just in that single focus point. When you half-press the shutter or press a dedicated AF button (if you have one), the camera will snap into focus once and if your subject moves, it won’t reacquire focus even if you continue half-pressing the button. Hence, the focus remains “locked”. The Single Area AF mode often requires the camera to lock into focus before allowing you to take a picture, so if focus is not acquired or your subject moves, pressing the shutter will do nothing (due to focus error). Some cameras allow you to change this behavior though – on the Nikon D810, for example, you can set the “AF-S Priority Selection” under “Autofocus” custom settings menu to “Release”, which would let you take pictures even when focus is not acquired properly. A couple of things to note about the AF-S mode – if you mount an external speedlight that has an “AF-Assist” red beam, you will need to be in AF-S mode for it to work. The same is true for the “AF-Assist” lamp in front of your camera, it will only function in AF-S mode. Another focus mode that is available on all modern DSLRs is called “Continuous/AF-C” (Nikon) or “AI Servo” (Canon). This mode is used for tracking moving subjects and it is a must for shooting sports, wildlife and other non-stationary subjects. The way this mode works, is it analyzes the subject movement and predicts where the subject will be, placing the focus at the predicted point. The nice thing about the Continuous mode, is that it will automatically readjust focus if you or the subject move. All you need to do is continue half-pressing the shutter button or holding the dedicated AF button (if you have one) on your camera and the autofocus system will automatically track any movement. 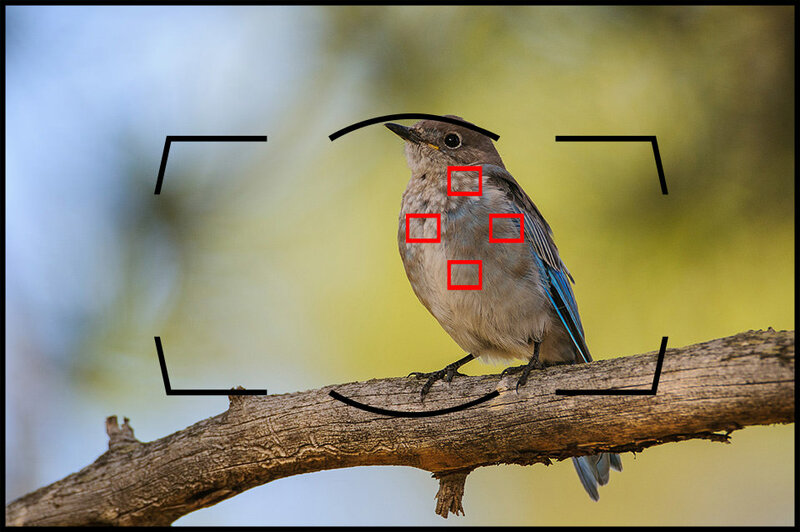 Compared to Single Area AF, the Continuous mode is generally highly configurable (especially on high-end DSLR models) and can do complicated tasks, such as tracking subjects with a single or multiple focus points. Some cameras also have another mode called “AF-A” (Nikon) or “AI Focus AF” (Canon), which is basically a hybrid mode that automatically switches between Single/One-Shot and Continuous/AI Servo modes. The way this works, is the camera detects if the subject is stationary, in which case it automatically switches to Single focus, while if the subject moves, it will switch to Continuous focus. The default method on lower-end Nikon DSLRs is AF-A and it works quite well for most situations. Many of the higher-end/professional DSLRs do not have this mode, since it is designed for beginners. The newer Full-time Servo AF mode, also known as “AF-F”, was introduced by Nikon on such DSLRs like Nikon D3100 and Nikon D7000, specifically for recording video in Live View mode. This mode automatically tracks subject movement and acquires focus during video recording. While it seems to sound like a great feature, it does not work very well for fast-moving subjects and Nikon will have to work on improving this mode to make it faster and more usable. Don’t worry about this mode if you do not shoot video. I personally leave my Nikon camera on AF-C mode all the time and only switch to AF-S when the camera cannot focus in low-light situations. To make things more confusing, many DSLRs also have something called “AF-Area Mode”, which allows photographers to choose several options to use while operating in Single Area/Continuous modes like AF-S, AF-C, AF-A and AF-F. Many of the entry-level/semi-professional DSLRs allow you to pick a certain “AF-Area Mode” within camera menu, while pro-level DSLRs like Nikon D300s/D700/D3s/D3x have a dedicated AF-Area Mode Selector on the back of the camera (newer pro-level DSLRs like D810 and D4s got rid of this selector and replaced it with a single button on the front of the camera). So, what do these AF-Area Modes do? Let’s go through them one by one. When you choose the “Single Point” (Nikon) or “Manual AF Point” (Canon) AF-Area Mode, the camera only uses one focus point that you choose in your viewfinder to acquire focus. So if you move your focus point up/down/left/right, the camera will detect contrast only on that particular focus point, using either vertical or cross-type sensors (depending on which one you have chosen). I use Single Point AF-Area Mode when photographing landscapes, architecture and other stationary subjects. In “Dynamic” (Nikon) or “AF Point Expansion” (Canon) AF-Area Mode, you still choose one focus point and the camera will initially acquire focus on that particular focus point. However, once focus is acquired, if your subject moves, the camera will utilize the surrounding focus points to track subject movement and keep focus on your subject. You are expected to track the subject by panning the camera along with the subject and making sure that the subject stays close to the initially selected focus point. If camera selects a surrounding/different AF point, it will not be directly visible inside the viewfinder, but will be visible after the image is taken. The Dynamic AF-Area Mode works great for fast-moving subjects like birds, because it is not easy to keep focus on birds in flight. Higher-end DSLRs have the ability to control the number of surrounding focus points to activate for this type of shooting. For example, the Nikon D7100 allows choosing between 9 points, 21 points and 51 points in Dynamic AF-Area Mode. So if you only wanted to track a small portion of the scene, you would pick 9 points and if you wanted to track the entire frame, you could pick all 51 points to track your subject. Lastly, many of the modern DSLRs from Nikon have a “3D-Tracking Mode”, where you initially pick the AF point and the camera will automatically activate as many focus points as needed to track subject movement. The cool thing about the 3D-Tracking mode, is that it uses a special scene-recognition system that actually reads colors and will track your subject automatically, letting you compose your shot while the subject moves. For example, if you are photographing a white bird among many black birds, the 3D-Tracking system will automatically focus on and track the white bird, even if the bird moves or if you move the camera, letting you compose your shot. If you compare 3D-Tracking to Dynamic AF-Area with a certain number of focus points selected, the 3D-Tracking method will use all available focus points on the camera to track your subject, while Dynamic AF-Area mode divides the focus points to “zones”, activating only the surrounding focus points (as many as you selected). For example, if you choose 9 focus points, subject tracking will only work within a zone of 9 total focus points that are surrounding the focus point you picked. If your subject moves away from all 9 focus points, the camera will not be able to focus on the subject anymore. In 3D-Tracking mode, the camera will continue tracking the subject (newly selected focus points will be displayed in the viewfinder), even if it significantly moves away from your initial focus point. I use the Dynamic AF-Area mode a lot when photographing birds and wildlife and typically shoot with a smaller number of focus points activated, between 9 and 21 focus points. I have some mixed feelings about the 3D-Tracking mode for photographing birds hand-held, since it does not seem to be as quick as the non-3D mode, especially when a smaller number of focus points is used. The “Auto-Area AF” (Nikon) or “Automatic AF Point Selection” (Canon) Mode is the “point-and-shoot” method of acquiring focus. Depending on what you are photographing, it will automatically pick what to focus on. It is a pretty complex mode, because it will actually recognize skin tones of a person in the frame and will automatically focus on him/her. If there are multiple people in the frame, it will focus on those that are closest to the camera. If the camera does not detect any skin tones, it will typically focus on the closest and largest object in the frame. If you shoot in Single Area/AF-S mode and select “Auto-Area AF”, the camera will actually display what focus points it will use for a second, allowing you to see and confirm the area the camera will focus on. The same thing can be done on Canon DSLRs, but it is called “Automatic AF point selection in One-Shot AF mode”. I never use this mode, because I want to control where to focus, instead of letting the camera do it for me. The latest Nikon DSLRs like D810 and D4S came with the a new “Group-area Autofocus”. When compared to the regular single point AF mode, Group-area Autofocus activates five AF points to track subjects. 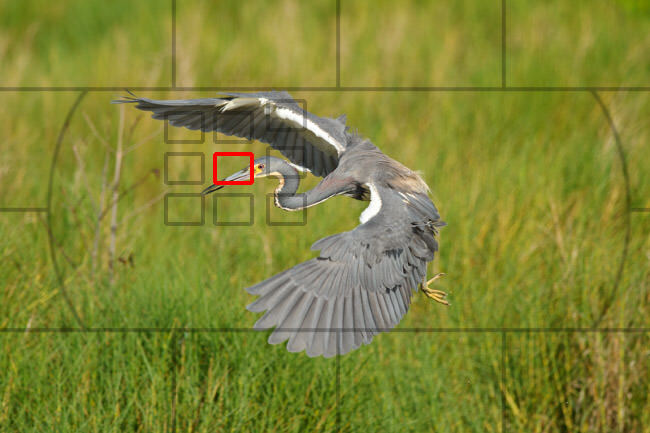 This focus mode is great for initial focus acquisition and tracking of subjects when compared to a Single-Point or Dynamic AF, especially when dealing with smaller birds that fly erratically and can be really hard to focus on and track. In such situations, the Group-area AF mode might give better results than Dynamic AF, showing better accuracy and consistency from shot to shot. How does Group-area AF work? Basically, within the viewfinder you see four focus points, with the fifth one in the middle hidden. You can move all four focus points by pressing the multi-touch controller on the back of the camera (ideally, you want to stay in the middle, because the focus points in the center of the frame are cross-type and the most accurate). When pointed at a subject, all five focus points are activated simultaneously for the initial focus acquisition, with priority given to the closest subject. This differs from the the Dynamic 9 AF mode quite a bit, because D9 activates 8 focus points around the center focus point, with priority given to the chosen center focus point. If the camera fails to focus using the center focus point (not enough contrast), it attempts to do it with the other 8 focus points. Basically, the camera will always prioritize the central focus point and only fail-over to the other 8 if focus is not possible. In contrast, Group-area AF uses all 5 focus points simultaneously and will attempt to focus on the nearest subject, without giving preference to any of the 5 focus points. Group-area AF is especially useful when photographing birds, wildlife and non-team sports. 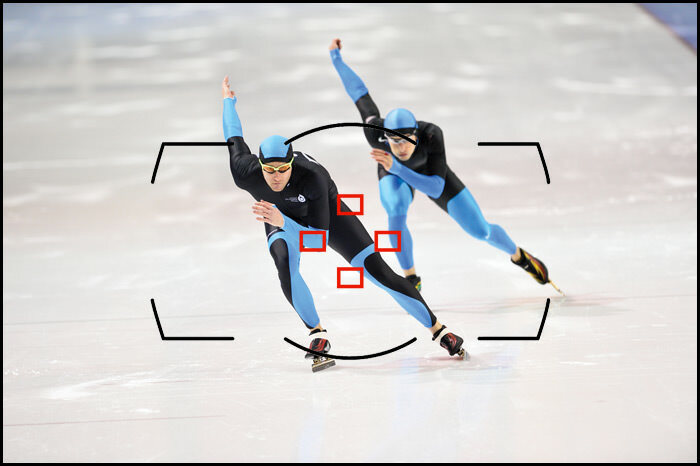 In the above sample image of speed skaters, if your goal is to focus on the front runner, Group-area AF would do wonders, as it would automatically acquire focus on and track the runner that is closest to the camera. Another good example can be a perched bird sitting on a stick and you are looking at it a little from above, so the ground behind the bird is clearly visible. With Dynamic AF mode, whatever you are pointing at is where the camera will initially attempt to acquire focus. If you are right on the bird, the camera will focus on the bird. If you accidentally point to the ground behind the bird, the camera will focus on the background instead. This can get quite challenging when photographing small birds, especially when the branch or stick they are sitting on is constantly moving. Getting initial focus point is important and the quicker you do it, the better the chance of capturing and tracking action, especially if the bird decides to suddenly take off. As I have mentioned above, with Group-area AF, there is no preference given to any focus point, so all 5 focus points are active simultaneously. In this particular situation, since the bird is closer than the background, as long as one of the 5 focus points is near the bird, the camera will always focus on the bird and not the background. Once focus is acquired, Group-area AF will also track the subject, but again, only if one of the 5 focus points is near the subject. If the subject moves fast and you cannot effectively pan your camera in the same direction, focus will be lost, similarly to what happens in Dynamic 9 AF mode. In terms of tracking, I personally found Group-area AF to be pretty fast, but it is hard to say if it is as fast as Dynamic 9 AF – in some situations, Dynamic 9 AF seemed to be a bit faster. Another important fact I should mention, is that when you use Group-area AF in AF-S mode, the camera will engage face recognition and attempt to focus on the eye of the nearest person, which is neat. For example, if you are photographing someone between tree branches and leaves, the camera will always attempt to focus on the person’s face instead of the nearest leaf. Unfortunately, face recognition is activated only in AF-S mode, so if you photograph fast-moving group sports and you need the camera to lock and track on a subject’s face (and not on the nearest object), your best bet will be to use Dynamic AF instead. Clockwise from the top left: Single-point AF mode, Dynamic-area AF mode (9 points), Dynamic-area AF mode (21 points), Dynamic-area AF mode (51 points), 3D-tracking mode, Auto-area AF mode and Group-area AF mode. The newly-released DSLRs have additional AF-Area Modes like “Face-priority AF”, “Wide-area AF”, “Normal-area AF” and “Subject-tracking AF” for use in video recording. These modes are probably going to be incorporated into all future Nikon DSLRs with video capability going forward. I’m not going to discuss each one of these in detail, because they are specific to certain camera models and will probably change in the future. 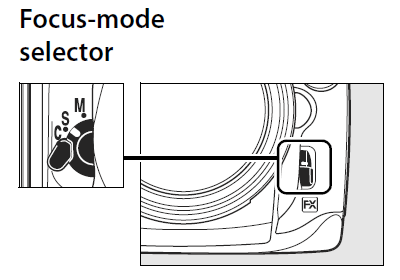 Canon also has some AF-Area Modes like “Spot AF”, where you could fine-tune your focus inside an focus point. These extra AF-Area modes are specific to certain Canon cameras like Canon 7D. Note: Not all of the above focus modes may be available on your Nikon DSLR. The new AF-F and other AF-Area video modes are not included in the above chart. Single-Point AF-Area Mode Camera acquires focus only once and on the selected single focus point only. Camera focuses on the selected single focus point only and will reacquire focus if the subject moves. Camera detects if subject is stationary or moving and will automatically select whether to use AF-S or AF-C. Only one focus point is used in either case. Dynamic AF-Area Mode Disabled, works just like Single-Point AF. You choose an initial focus point and once the camera acquires focus on the subject, it will engage the surrounding focus points to track subject movement. The number of surrounding focus points to use can be selected in camera menu. Camera detects if subject is stationary or moving and will automatically select whether to use AF-S or AF-C. Dynamic AF-Area with 3D-Tracking Disabled, works just like Single-Point AF. Instead of using a particular number of surrounding focus points, the 3D-Tracking activates all available focus points and uses color recognition to track subjects. You pick the initial focus point and the camera will track the subject across the frame automatically, letting you recompose the shot without losing focus on the subject. Camera detects if subject is stationary or moving and will automatically select whether to use AF-S or AF-C.
Group-Area AF Mode Camera activates five focus points and focuses on the nearest subject. If faces are detected, the camera will give priority to portrait subjects. Camera automatically focuses on the nearest subject and will track the subject in the frame, as long as the subject remains close to the five selected points. Face detection is disabled. Not available. Auto-Area AF Mode Camera automatically picks a focus point, depending on what’s in the frame. Camera automatically picks a focus point on a moving subject and will track the subject in the frame. Camera detects if subject is stationary or moving and will automatically select whether to use AF-S or AF-C. So far you have read a lot of technical information on each focus mode and AF-area modes. Let’s now go through different scenarios and examples for you to fully understand and grasp the information above. The camera settings I show below only apply to Nikon DSLR cameras. When taking portraits of people that pose for you outdoors in daylight, any of the autofocus modes should work perfectly fine. If you shoot in AF-S mode, the camera will only focus once when you half-press the shutter, so just make sure that you or your subjects don’t move once you acquire focus right before taking a picture. By default, your camera should not let you fire, if focus is not properly acquired in AF-S mode. If you are shooting in AF-C mode, just make sure to acquire good focus before taking a picture. AF-A mode works great for portraits as well. When it comes to AF-Area modes, I would stick with the Single-point AF-Area Mode, since your subjects are stationary. It goes without saying that you should always focus on the closest eye of your subject, especially when standing close. Photographing people indoors can be quite challenging, especially in low-light. If the light levels indoors are poor, I would shoot in AF-S mode to make sure that my AF-Assist beam helps me when needed. If you are using a speedlight, AF-S will make your speedlight use the AF-Assist red beam to acquire focus. You cannot do that in AF-C mode. The AF-A mode should also work well for these types of situations, but I would still opt to use the AF-S mode instead. In terms of AF-Area modes, I would pick the Single-point AF-Area Mode and choose the center autofocus point for better accuracy when shooting in low-light situations. 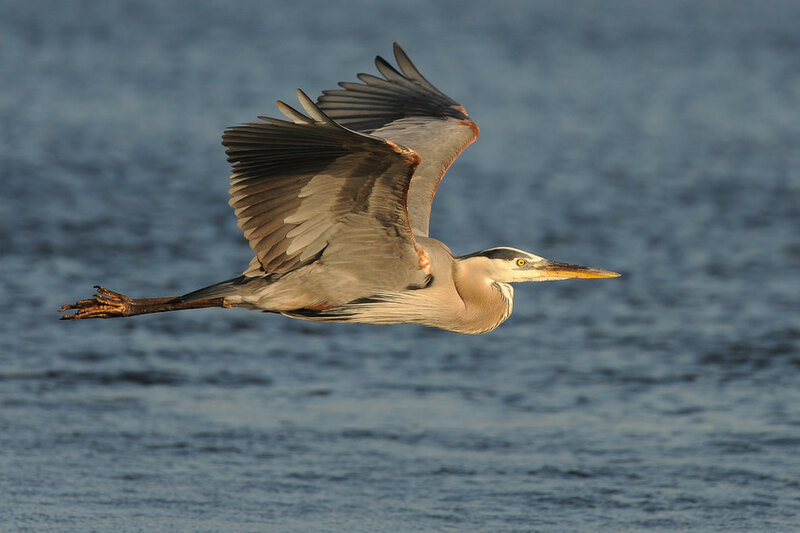 Birds are extremely tough to photograph, since it is hard to predict their behavior and they are often very fast. As I have pointed out above, I would shoot in Continuous/AF-C mode and pick either Group-Area AF Mode or Dynamic AF-Area Mode with focus points between 9 and 21 (I prefer to leave focus points at 21, but 9 is generally faster). I have tried using 51 focus points and also tried shooting in 3D-Tracking mode, but found those to be slower and less reliable than using less focus points. I use the center focus point 99% of the time when photographing birds and only change focus points when birds are perched on something. Again, the center focus point is normally going to give you the best results. If you are dealing with small birds and have a hard time with initial focus acquisition, give Group-Area AF a try (if available). For landscapes and architecture, all focus modes work fine, but I prefer to switch to AF-S mode, since there is nothing to track. In low-light situations, you will not be able to utilize the AF-Assist function on your camera, because of distance issues. So if your camera has a Live View mode, try to use that instead on a tripod and use the contrast-detect method to focus on a bright object in your scene. Otherwise, the only other option is to turn off autofocus and manually focus your lens. When taking pictures of landscapes and architecture, you have to be extremely careful about where to focus and need to understand such things as depth of field and hyperfocal distance well. You can find more information about these in my Landscape Photography Guide. In terms of AF-Area modes, you definitely want to use Single-point AF-Area Mode in order to focus precisely on a certain part of the frame. When photographing large animals, I would shoot in Continuous/AF-C mode and use Dynamic AF-Area or 3D-Tracking modes, both of which work great. Animals are normally not as fast as birds (although they can be even faster at times), so unless you are shooting fast action, I would just pick Dynamic AF-Area with the highest number of focus points or use 3D-Tracking. Hopefully the above scenarios will be useful for you to understand when to use which Autofocus and AF-Area modes. Now might be a good time to go back and review the chart above and see how well you can understand it. I frequently get asked about how to focus when photographing a small group of people. Before I talk about focus modes, let me point out a few important things here. If you are using a standard or a telephoto lens, you have to be careful about the camera to subject distance when shooting at large apertures. If you stand too close to the group and shoot at large apertures like f/1.4-f/2.8, only one or two people might be in focus while everyone else is blurred, unless everyone is located on the same plane. The solution is to either change your aperture to something smaller like f/5.6 or f/8 or to stand back/move away from the group, so that your depth of field is increased, or do both. If you want to blur the background and shoot at large apertures, your only choice is to put everyone on the same plane, parallel to your camera. Imagine how the group would be standing if they were all touching a flat wall with their heads – that’s how they need to stand. In terms of autofocus modes, if you are shooting in broad daylight, any of the AF modes work fine and I would pick Single-point AF-Area Mode for focusing. Note: As you may have noticed, I always leave my “AF-S Priority Selection” and “AF-C Priority Selection” to be “Focus” and “Release+Focus”, respectively. Here is why. By keeping “AF-S Priority Selection” at “Focus”, I force my camera to not let me take a picture when I do not have good focus. I do not use the AF-S mode very often, but when I do, I want to make sure that my focus stays good. As for the “AF-C Priority Selection”, the “Release+Focus” mode works great for most situations – the camera will do its best to acquire good focus, but won’t hold up or delay the shutter too much, letting me shoot when I want. I don’t see the point of using either “Release” or “Focus” in AF-C mode. “Release” won’t care if your focus is good or not (what’s the point of autofocus then?) and “Focus” won’t let you take a picture until focus is locked. If I want my focus to be that accurate, I will switch to AF-S mode instead. Just leave these two settings as shown above and forget about them. Use the center focus point. Whether your camera is equipped with 9 or 51 focus points, you do not want to use the focus points in the corners of the frame when shooting in low-light conditions, simply because they are not going to be very functional/accurate. The center focus point is often your best bet, because it is a cross-type sensor that works better than any other focus point in your camera. But what about framing and composition if you have to focus in the center? For those situations, the solution is to move the autofocus function from your shutter release to a dedicated button on the back of the camera, then focus on your subject and recompose. This technique is called “focus and recompose“. Most DSLRs, including entry-level ones can do this. Professional-level DSLRs have a button called “AF-On” specifically designed for this and you can easily activate it in Custom Settings menu by going to AF-Activation and picking “AF-ON Only”. But you have to be careful when recomposing your shots after focusing, especially when shooting at shallow depths of field with a large-aperture lens. If you focus and then recompose, your focus plane will most likely change, resulting in bad focus, so keep this in mind. Use the “AF-Assist” feature on your camera or speedlight. It is there for a reason – use it every time you have problems focusing in low-light. To activate it, make sure that “AF-Assist” is turned on in your camera menu and the AF-S mode is selected. Look for contrast and edges. Instead of trying to focus on plain, one-colored objects, look for “contrasty” objects that stand out from the background. Add some light/Turn on more lights. Sounds pretty basic, but if you are having problems focusing, what is simpler than adding a few more lights or turning more lights in the room? Lola and I were once photographing a corporate event and the ballroom was so dim, that we had a hard time getting good shots. We both switched to AF-S and were using our flashes for focusing, but high ceilings and lack of ambient light were making our images look very flat. Lola then approached an event coordinator and simply asked her to turn up the lights and our problems all went away and we came back with beautiful pictures! Watch your shutter speed. It might look like bad focus, but it might actually be camera shake that causes your images to look soft. Using a lens with Vibration Reduction technology certainly helps, but still make sure to keep your shutter speed relatively high. If you have to work with slow shutter speeds, work on your hand-holding technique. Use a tripod. With a tripod, you can get very accurate focus in low-light, without worrying about moving your camera. Use Live View Contrast Detect. If you are using a tripod, try focusing in Live View mode using Contrast Detect. That’s how I focused on the moon during the last lunar eclipse, as described in my “how to photograph a lunar eclipse” article. Whenever I use a tripod, I always try to use contrast detect, because it gives me better and more accurate results. Even manually focusing is much easier in Live View mode, since you see a lot more on the larger LCD than inside the camera viewfinder. Use a bright flashlight. If your camera does not have a built-in AF-Assist lamp, use a bright flashlight and ask someone to point it at your subject while you try to focus. Switch to manual focus mode once focus is acquired, then ask your helper to turn off the flashlight and take a picture without you or your subject moving. For photographing landscapes at night, a laser pointer works quite well (don’t use a laser pointer for photographing people or animals!). Use manual focus. Kind of goes against the title of this article, but you should still learn how to manually focus your lenses and not be afraid to do it. Sometimes manually focusing your lens is quicker than trying to use any of the autofocus methods. Many landscape, macro and architecture photographers shoot with manual focus lenses. I skimmed your article, liked the way you composed it, and then printed it to study in detail with my highlighter ready to go. This is very important information that is rarely explained in an understandable and comprehensive way. Glad to you did it. Hope it is as good as it looks, and Ii suspect it will be. I’ll write again after my study of it. hi! i just bought my nikon ds3100. your article is very comprehensive. thank u! I found your site very professionaly and unique. Thanks for providing such detailed info. I need a clarification , I usually use a single point AF mode for focusing and center weighted average mode for metering. What I see in the viewfinder is a square correspondent to where I exactly to focus. OK but for exposure point of view what is the relation of that single point with my “center weighted average” metering mode. I get always confused on this two items. This AF points related only focusing points and metering is evaluated irrespected of that poinys ? As i know center weighted is always centerweighted. However spot metering is metering the actualy active focuspoint (so even if you are in dx or group af mode still the active one will get the attention from light metering aspect.) Still for biff i think center weighted is the best with d9 or group around the very midle af point. Simple because if you have long lens it is easier to kerp the bird in frame like that. Than you can crop as needed. Very good class. A good teacher too. Thank you. – How do you factor in Continuous (High/Low) Speed shooting into the Dynamic Area Mode selection? i.e does the frame rate affect your choice of number of focus points or vice versa? – What are your thoughs on Nikon’s Focus/Release options? It would be very useful if these other factors could also be added to your typical shooting scenarios. Which permutations are likely to give the best results? KSPGM, I find the Continuous Low Speed to be a useless feature for my photography needs…I never use it, because all it does is slow down my camera. For wildlife photography, I select Ch, AF-C and Dynamic Area with 21 focus points and shoot at maximum fps. Thankyou for your reply Nasim. I have (like most people I guess!) been a bit confused about these options. I generally follow your advice, but I do sometimes use Focus only when shooting in AF-C mode. One other point which I forgot about last time. That is the other function which determines how long the autofocus waits before refocusing: on a D300s it is ‘CSM:a4 Focus tracking with lock-on’. What are your thoughts on this option please? KSPGM, sorry for a late response. I did experiment with the “Focus tracking with lock-on” feature before and found that the “Normal” setting works best for me. If I am photographing a flying bird and a tree obstructs the bird for a short period of time, I do not want the camera to refocus on the tree immediately. Therefore, I would not turn focus tracking off or set it to short. Great article! For now, I think I don’t have more questions about AF. Thank you very much! You are most welcome Bruno! AF area modes was one of the confusing things that I had to read the manual a few times over to understand. One thing still isn’t clear : the difference between 3D tracking and dynamic area , not in terms of focus points but focus method. The manual, as well as this article, states that 3D tracking uses color-contrast to detect subject movement. The manual does not state that dynamic area does not use color contrast, however, so I won’t jump to conclusions and take it that dynamic area will work better when subject and background are similar in colour. So aside from number of focus points used (moot in my case, since apparently dynamic area uses all 11 points on D90, there is no option like D7000 to select 9/21/39 points). Thank you Nasim. So this is one area I’ll keep in mind to dig deeper into ! Studied it with highlighter at my finger tips. Well done. I will keep as a reference piece near my Nikon camera manual. Glad you found it helpful Peter! I had some grammar problems in the article and forgot to talk about the different release modes – I have just updated the article some additional information. As far as focusing on the eyes, if a person is looking at you straight, focus on either eye. Thanks so much for this posting. It is so useful! I shoot my kids too. I’m wondering if I focus on their eye and they move, does that mean the camera knows this on Dynamic AF (51 points) and I would not need to “recompose” the camera? I would just press down the shutter? Thank you! You are most welcome Hari! Wow Nasim, you have done it again! Amazing and comprehensive article and one I will return to when in doubt. I am still a little puzzled by the cross type sensor if using singe point in the outer area of the total points for a specific camera. I guess it is almost irrelevant with my D90, because it has so few total points (yet another reason why I want to upgrade…he he). But from what I understand out of your article, I should not be using the outer points to single point focus? No, you can certainly use the outer points, but since they are not cross-type sensors, they are not going to be as accurate. When you shoot in low-light situations, if AF does not reliably work, then simply switch to the center focus point and you should get much better results. Sorry for a late response!!! Thank you Nasim,you have covered this often confusing area well,thou no mention of the focus tracing lock-on settings (D300 / D3/D700) Your experience with these settings ,off ,short , normal , long , in AF-C dynamic for sports situations /scenarios. You are most welcome Craig! The focus tracking feature is only available on the pro-level Nikon bodies, but I will certainly add some info about that to the article. In short, I find that “Normal” works best in most situations for me. Turning focus tracking off will result in constant refocusing, which is not good when I track a subject like a flying bird. If another bird happens to fly in front of me or another object pops up in the frame, I do not want the camera to reacquire focus on the object – I want to track the bird. There are only few cases where turning focus tracking off works well. Thanks for another great article. I’ve been searching for a good reference material in AF modes since a long time. I have a query regarding the AF priority modes. I’m not able to find any “Release+Focus” option for AF-C priority in Nikon D7000. Can you confirm if the D7000’s “Release” priority is same as “Release+Focus” other Nikon Pro cameras? The ‘release+focus’ is in between the other two – but by how much Nikon do not say. But like Nasim, I have found that the ‘Release+Focus’ option is often the best compromise. ‘Focus’ will not fire till it has achieved focus and is clearly best for static subjects; ‘release’ fires away without pausing to think! I think ‘release’ is for when you just can’t aford to miss the shot – even if it is a bit blurred. That is not a problem for me as I do not make a living from photography! probably use at a press conference; ‘Release+ focus’ hesitates a bit before firing and gives the AF system just a little more chance to lock-on. For me, this option seems to give the most success for the type of shooting I do. Pradeep, KSPGM provided the answer above and it is correct – the D7000 does not have Release+Focus option in AF-C mode. Don’t worry about it too much though, since focus tracking on the D7000 seems to work fine with just “Release”. Can you explain what is the use of AF Lock (AE-L/AF-L) feature? How & when to use AF Lock? Nikon D7000 has a custom setting for this button action to AE lock only, AF lock only, AE/AF lock and many more. Can you let me know what should I set the button action to do? AF lock is used to recompose after acquiring focus, say first you frame and get focus , then recompose. In AF-C the camera may try to refocus and focus at something other than subject. To prevent this, pressing AF-lock tells the camera not to refocus when you recompose. In AF-S mode, the focus remains locked while the shutter button is half-pressed. AE-lock also locks the exposure values selected. I prefer to use AF-lock only, letting exposure vary but I can see why many would want to use both AF-L and AE-L – in a contrasty frame, the readjusted exposure may result in say a portrait with udnerexposed face to prevent a bright window from blown highlight, or vice versa overexpose the subject when the background is dark. So it depends on your lighting and composure. Pradeep, Rahul’s answer above is correct. To be honest, I almost never use the AF-lock function on any of my cameras, so don’t worry about it too much. AE-lock, on the other hand, can be useful when I photograph panoramas to lock my exposure values. I am D90 user. Do D90 have “Relase+focus” command??? or D90 just equip with Release and Focus? how to change the setting from Release to Focus? D90 dont have any cross-type sensor? Здравствуйте. Недавно набрёл на Ваш сайт в дебрях ссылок в комментариях на Nikonrumors и добавил в избранное. Очень много полезного материала и замечательное портфолио. Теперь частенько читаю Ваши статьи. Пишете ясно, просто и познавательно, спасибо большое! Есть непростой вопрос: как влияет стабилизатор на качество изображения? Статья Тома Хогана на эту тему заставила призадуматься — действительно ли стабилизатором желательно пользоваться как можно реже? Я иногда замечал, что при равных условиях резкость может быть меньше обычного, но опыта у меня мало, поэтому интересно, что об этом думают практикующие профессионалы. Если не сложно, просветите, пожалуйста. Дмитрий, спасибо большое! Прошу прощения за столь поздний ответ. Я полностью согласен с Томом по поводу использования стабилизатора в благоприятных условиях. Не имеет смысла использовать стабилизатор, когда скорость выдержки превышает фокальную длину оптики. Например, если фотографируете на 300мм с 1/1000 секунды, стабилизатор будет только мешать, так как стабилизация изображения при такой скорости не нужна. Очень многие фотографы не понимают того, что снимать нужно не сразу, а через некоторое время (около 1 секунды) – после того, как кадр полностью стабилизирован. Я лично включаю стабилизатор только в том случае, когда скорость выдержки ниже фокальной длины оптики – все остальное время он у меня выключен. Скорость (выдержку) стараюсь контролировать через Auto ISO, Minimum Shutter Speed. Good article, very helpful! Now I see where to utilize custom modes. Awesome article once again. Tons of useful info and very well presented. Fantastic article !! Very Clearly explained!! Thank you Nasim, great article!! Benny, thank you for your feedback. I will put together something on AE-L and AF-L functions sometime soon. I found your site through the recipe side (I’m going to try the Chicken Tabaka this weekend) and I was delighted to find some really great photography info was well. I really enjoyed the AF mode explanation, especially the different scenarios. I recently took my D300 to the National Zoo to photograph their 7 lion cubs and was a bit disappointed in my photos (as disappointed as you can be with 7 cute lion cubs as your subject). I had done some research on AF modes and it pretty much lines up w/ your Scenario 6 and the table. But your explanation was very helpful. Dear Nasim you have skimmed/churned every bit of what we immatures are always looking for on the net and in the manuals. Thank you very much. INCREDIBLE article! Thank you so much. This is by far the most elaborative explanations i have ever read …. thanks a million to you !! Thank you Nasim , Nikon should engage you to rewrite their manual. If Iam not asking for too much would you please explain the AEL and AFL feature. The manual (Nikon d 3100 ) falls short here too. Vinay, not sure if you have already seen it, but I posted a separate “Nikon AE-L AF-L button” article. This is exactly what I’m experiencing after using a few fast lenses to shoot kids at close distance (hence shallow DOF). On my D300s, AF-C proves to be very helpful in these situations. However, unless I use AF-C along with 3-D Tracking (which does not work well all the time, esp. with busy background), I must first thumb-select an active focus sensor to recompose and then use that sensor to track my subjects. Personally I find these procedures very cumbersome compared with the simple focus-then-recompose technique using AF-S, which has worked so well on slow lenses for me up till now. When you said in Section 2.4 you use AF-C all the time, do you use techniques other than the two that I just described? Mosum, for your particular situation, the best bet would be to move the focus point to where your subject is, instead of focusing and then recomposing. I know it is slower and not always practical, but at least you won’t have to deal with focus errors due to change in focus plane. Hallo. Thanks for the great explanations. There is just one thing i do not get: the AF-C continous servo can be used in two ways: with or without the 3D tracking; is this correct? in the second case focus will move and follow, in the first they will just spot other focus points around the main focus areas, but they won’t “track”. Is my understanding correct? I mean, i would use, let’s say, AF-C, with Dynamic AF areas mode, 9 points selected in the relative menu. But then if i choose the 3D tracking it is different purpose and focusing functioning. Kindly rectify if i am misunderstanding. Matteo, the AF-C mode can be used with the selected number of focus points in camera menu or 3D tracking. When 3D is disabled and say 9 focus points are selected, the camera will track the subject only with the surrounding 9 focus points. So if your subject moves further away from the 9 focus points, the tracking will stop. The 3D tracking on the other hand, activates ALL focus points for tracking, so if your subject moves from one side of the frame to another, the camera will activate all focus points to keep the subject in focus. 3D tracking works differently than regular tracking – it is much more complex in nature. I’m so glad i came across this website. I find your articles extremely helpful and jargonless(if that is a word)! If you’re on a boat or a ship and you’re taking pictures of a landscape of say the mountains and the ocean with a couple of boats also in the frame, would you still use AF-S? Does the ships movement throw the focus out once you’ve pressed the shutter button half way down? I’d say it depends on the subject distance. Closer subjects could be blurry due to camera motion , while the focus wouldn’t be off, but your framing would be , depending on the frequency and amplitude of the oscillation : fast small boat would make framing very difficult as it would be bouncy, a cruise ship on quiet ocean would be relatively stable, unless you were doing low light/long exposures. Kartik, if the ship is moving fast and the distance between the nearest boat and you changes quickly, then it would be best to use AF-C instead of AF-S, especially if there is a delay between focusing and shooting. thank you, thank you, thank you! I spent hours browsing the internet for anything worth reading on this subject until I came across your article. You are very didactic and organized. I have two more questions. 1) I am new to the D700 and would like to understand how to go from single point to dynamic AF area mode with 3D without having to browse the menu in the camera. If I had previously selected in the menu (a3) that I want the 3D option, when I switch the dial at the back from single point to dynamic AF area mode (there are only three options: single point, area mode and auto) will the camera operate as the regular dynamic-AF area mode or it will operate as 3D? 2) There is something bothering me very much. At first, I had a5 to shutter/af-on, which should allow me to focus and lock the focus by pressing the shutter half way and then recomposing. But when I move the camera in such a way that my focus point ends up over an object in a different plane of focus, I hear clunk sounds in the camera (trying to refocus) and the camera will not hold the focus at my original point (my settings are single point AF-C). For instance, I am shooting a person in front of a background. I lock the focus by pressing the shutter half way and recompose, and at that point my center point of focus in hitting the background. I end up with a blurred picture. I couldn’t figure what settings were wrong. I was able to correct this problem by assigning the AF-on button to lock the focus (a5: AF-on only). Now I am able to lock the focus, recompose and then press the shutter to take the picture. It is ok with stationary subjects. But what happens next? Suppose I want to take a picture of a kid running towards the camera, and I don’t want him centered, of course). All I have to do then is to switch from single point to dynamic-AF area mode, lock the focus on my subject with the AF-on only button, and the camera will track the moving subject, or I need to revert to the shutter/af-on setting again? Is my line of thought correct? What am I missing? Thanks so much for sharing your knowledge and for having the patience to respond to each and every question posed to you! Very generous. You are most welcome Bina! That’s an excellent question. You go from Single Point to 3D Dynamic AF Area using the switch on the back of the camera – you just need to permanently set 51-Area 3D under “Dynamic AF Area” custom setting menu. If you need to switch to regular non-3D mode though, you will have to revisit the camera menu. So the only thing the menu controls, is how many focus points should be activated and if 3D should be enabled or not (last setting) – the actual single/dynamic/area drive is done through the back of the camera. As for your second question, you need to either turn on AF-ON permanently, so that focus is only activated when you press the button (and not on half-pressing the shutter), or you need to switch to AF-S mode so that autofocus is only activated once. Now if you are photographing a running child and you do not want him/her centered, then your best bet is to switch to AF-C, then move your focus point to where you want the child in your frame to be. If you keep the focus point in the center, you will not be able to focus and recompose quick enough. In this case, it should not matter if your autofocus is set to AF-ON only or on the shutter. Sometimes it is easier to keep the autofocus on the shutter for fast-moving subjects. Thanks for the excellent explanation. I always have doubts about what focus mode to use. The photos in my D7000 are often blurred. To improve this, the best setting in most parts of the situation would be AF-C at 21 points? I almost always use AF-S. Thanks so much. I find the articles on your site very interesting. However I’m stuck with the auto focus point. When I switch to Apperture the auto focus point moves to the right instead of to the center, this is very inconvenient aspecialy when taking macro pictures. How can I change this so the auto focus point says in the centre? I went through my manual but can’t find it. Martine, you can move the focus point by pressing the arrow buttons on the back of the camera. If you cannot move the focus point, your AF Area mode is probably set to something funky. Go to Custom Settings menu, then go to AF Area Mode, then pick Single Area. Then, you should be able to move the focus point. If nothing works, try resetting your camera settings and see if you can move the focus point. Such a simple trick and I couldn’t figure it out. I already made some pics this weekend but with the focuspoint out of center it was very hard. Makes me grin from beer to beer. Nice article. Confirmed my guess work. Great article. This is the most comprehensive description of AF settings I’ve found anywhere on the internet. Just one small correction of the AF-Area mode table. For recent Nikon cameras it is not true that the camera reacquires focus in single-point AF-C mode if the subject moves. This was indeed the behavior of older cameras, like D40, D50, D200, etc. However, as of D3/D300 series there is no difference of behavior between AF-S and AF-C in single point AF mode – the focus stays on selected AF point no matter if the subject moves. Huh? Maybe I read your reply wrong, but AF-S single point and AF-C single point are not the same. I have d7000 and d800 and if I have the camera set on AF-C single point, the camera continues to refocus if the focal distance increases or decreases. This question is not very relevant to this thread but since you have been using a D7000 i thought you might be able to help me with my problem. I have ensured that the lens foucs mode switch is set to ‘M/A’ and the focus mode selector in D7000 is set to AF. The control panels top right corner indicates ‘F–‘ error. I understand from the user guide that this error can only occur with a non-cpu lens. Your inputs would be of great help to me to understand what is exactly wrong. I would have to get the cam and lens replaced soon if something is faulty. It sounds like something is defective, either the lense or camera. Have you called nikon support? They will help you through trouble shooting and replacement. I had called them up and i was asked to ship the camera back to them to get the issue fixed. Instead i sent it to amazon and got a replacement. Works like a charm. I own a D80. The question is regarding fast focusing. Would the internal camera focus motor be on par with the focus motor in quality lens’ such as the 70-200? Which motor is selected when I attach a lens with an internal motor. I want the fastest one to be running, can both be used at the same time or is that just wishful thinking? Many thanks for clearing this matter up. Sweep sweep! Hi, I just bought Nioon D7000 & was going thru the manual. I was perplexed about the different AF methods explained in the manual as I was not sure which one to use when. My earlier camera D70s didn’t have such complex methods. Your article gives lot of clarity but ultimately user need to try & find his spot. My name is Nigel way down here in New Zealand. Thank you for your wonderful guide on explaining autofocus modes. Canon EF 70-200mm f/2.8L IS USM . The camera has not got 3D tracking mode. Thanks for this great article. Here is my interpreted summary. Please suggest if this is fine. Also, I have a question. When you refer a focus point, do you mean the AF points that are seen through the viewfinder. When I try to focus using AF points, the camera beep anf highlights a few point where it finds contrast. Can I control which exact point(s) I want the camera to find focus on, example, I want ot focus only on the right most AF point and no where else? I’ve been struggling to understand these auto focus mode quite a while and find this article very interesting. May be a basic question, would appreciate if you could help me understand. I have D5000, there are 11 foucs points as you know. When I set it to AF-S mode, does it mean that I have to concentrate only on 1 single red focus point and foget about remaining 10 focus points(are they not point of interest in this case). Thank you very much for your detail explanation of AF area modes. But one thing still isn’t clear for me; Difference between Phase Detection and Contrast Detection. I would like to learn technical detail. Can you help me? Thank you ever so much for this article. When i bought my Nikon D7000 in May this year i was new to DSLRs, although i used film slrs in the old days and then after a long hiatus had a few P&S cameras (and an iPhone haha). As you can imagine, my learning curve was steep but i don’t regret jumping in an buying this “over my head” camera. I have learned tremendous amounts and have shot around 9000 pics – some pretty nice ones here and there. Inititially i was completely confused with the fact that there were autofocus modes, and autofocus area modes (really…couldn’t they use different terminology LOL, but i guess it make sense). THEN, weeks ago, i read your fabululous article here. Printed it off and keep it with all my “notes” Out of all the tons of stuff i have read to figure out how to focus that pesky D7000, your article was the most useful and enlightening! All the other sources always only gave parts on the story, but you have put it all together, so succinctly. The scenarios are great. I feel like i can finally venture out of single point/ single focus area now! Thanks so much. All your articles are rich with information. Appreciate it! Its awesome site Nasim. I found your site yesterday and have been reading various tips and topics here. Though this site is very useful for all kind of photographers but i must say it is a great site to know the basics,particularly for a nikonian. I am a beginner and have been searching forums/sites for my doubts but most of the sites i came across ,were mainly created using canon terminology but this site is like a heaven for nikonian. I have not been subscribed to newsletters from your site yet but my mistake. i am going to subscribe right now. While reading the tips,i feel as if you are answering my doubts step by step. But i (and probably many more photographers) would love to see a new section here on “how to compose good photographs” mentioning some vital points for a good composition of an image. Thank you very much Nasim for sharing your knowledge with us. Keep it us. and yes a great and prosperous new years to you,your family and all the readers of the site. This article is the most comprehensive article about Nikon’s autofocus but yet simple to understand. What a good job you’ve done. 1. What is the function of AF-lock or AE-lock button in the side of Nikon’s viewfinder? how to use it properly? I think this is what you said about ‘dedicated button to autofocus in the back of camera’, right? what is the difference that I focus with that button and press the shutter half-way? 2. I use Nikon d7000 now (I bought it after read your review). I feel that 3d tracking autofocus has tendency to miss focus if I recompose my framing. Sometimes, it refocuses on object that has totally different color and shape with the previous object i focused before. Could you tell me what’s wrong with this? Thanks before for your time Nasim. I really look forward for your answer. in the d700, if the chosen focus point is not the center one, in-camera focus assist light does not light. i mean, if you move the focus point with the multiselector to a different point, it will behave differently. i have been a little puzzled at beginning, but now i have programmed the center button to reset focus point, and everything is ok. [Custom settin menu / Controls / Multi selector center button / Shooting mode / reset] i am not shure if this behaviour is well described in the manual (as everybody else, having owned quite a few nikon cameras i did not read the very thick d700 manual, but start using the d700 immediately with ease…). i don’t know where you can find the time for your web site, but we all are very glad to read from you! Great article, best I’ve read explaining autofocus modes. I finally understand what modes to use for sports vs. indoors on my Nikon D7000 now. Thank you!! Thanks so much for your articles, you are so kind to spend your valuable time doing this, much appreciated. Could you explain in a D7000 how the shutter speed 1/250x works. It comes on my camera, & I can’t turn it off. I consider myself as an amateur photographer, and as part of my conitnuous learning I surf the web looking for good articles like this one. My gear is a Nikon D7000 and this article fits me perfectly because I’m able to quickly identify all in my camera. For bird shooting I use my Nikor 80-400 lens and will definitely put in practice your advice. Thanks for writing such a detailed and pretty well put article, I believe it will help a lot of photographers around the world. Hi, thanks for this article, it is very complete and easy to understand. I have an extra question: could you explain some of the reasons why the AF system might fail. I have read about some scenarios under which it fails, but what about when it stops working at all: is this a common problem? is it related to dirty lenses or reflector? What other mechanical factors can affect this? Excellent article, Nikon should pay you loads of money for this great explanation. I just recently joined the ‘Nikon D7000 owners camp’. Nikon’s user manual is really ‘dry’ is just explains what the different options do, but it does not explain which option should you choose regarding the situation. They made a fantastic camera but I feel that they do not explain it’s features in details. This is like a modern car where you can change the suspension and motor settings with one or two buttons according to the different situations (like city, sport, rain etc.) but they would not explain in which circumstances should you choose what. Anyway, I have been shooting with Nikon D50 for 6 years but I realised I have to learn the Nikon D7000. So far I made some 1000 pics, sports (mainly speedway), but half of them are not in focus. I’m sure there’s something with these settings so I’ll mess with these based on your explanation and will see if I can improve my photographic skills with the D7000. Just wanted to say thank you – really thorough article and learned a lot! Many thanks for this clear and comprehensive article on AF. I have a question though, about the types of AF sensors–cross and vertical. If the cross sensors are better and more accurate, why aren’t all of the sensors in the AF system of the cross-type? Are the cross sensors more expensive? Do the vertical sensors have some advantage that the cross-type sensors do not? Thanks for all of your wonderful articles–please keep them coming–they are much appreciated! I’m a nikon shooter and have been shooting for a while now. I have read so many online blogs but none are this good. I mean one thing is to have an exceptional grip on the subject and it’s a different ballgame to be able to put it in words for everyone to understand. I’m really really glad i stumbled through yourwebsite. Really informative and to the point. I have a question on recomposing after focus lock, i’ve tried it so many times but i don’t get focus the way i like. it’s always soft. I’ve used a nikon D800 with 16-35, 70-200 or any flagship lens for that matter, i’ not able to tackle this issue. Thanks so much for posting this article. Very good explanation. Do you have any recommendations for shooting moving skiers on a snowy background. My Nikon D40X does not know where to focus and I have been losing a lot of photos. The lens goes back and forth but will not lock on the subject. You mentioned that using the centre focus point is best for optimum focus. 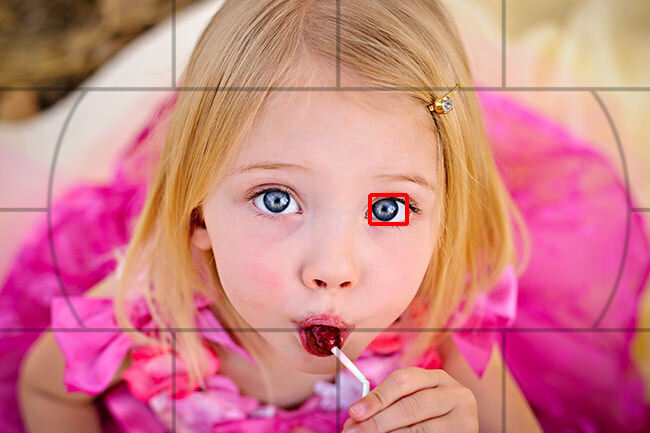 But what if I am taking a portrait and my subject is on one side of the screen (using the rule of thirds)? I would obviously want to focus on the eyes right? Would this not mean choosing a fcus point which is not the centre focus point? Could you shine some light on this please. By the way, I love your website and articles, they are so helpful. Keep it up! I am a ” Wedding Photographer “, using my D3100 with it’s kit lens & SB 700 flash. Now willing to do some invest on it ( upgrading my weapons ). What should i do ? i ) Buy a D7000 with it’s kit lens (AF-S 18-105mm VR Kit Lens) after selling my D3100 with it’s kit lens ! ii) Buy a AF-S DX NIKKOR 16-85mm f/3.5-5.6G ED VR (5.3x), in exchange of 18-55 or 18-105 (kit lens of d3100 & d7000) & using it with my D3100 ! I hv noticed that some1 hv just purchased 50mm 1.8 G lens for his D3100 and everything worked fine except that when he takes group photos with this lens he ended up taking only person in focus..as he wanted to know how should he take all the persons in frame focused. please let me know what should i do? Purchase a new D7000 or should i purchase new Lenses with my older D3100 ? I just want to make my Photos much more better than now …. plz reply , thanks in advance …. Hi Bubai. Im not an expert in this but i have experiences about nikon entry level dslr. i used (some were borrowed) d40x, d60, d3000, d3100, d5000, d90 and d7000 (i use this now and planning upgrade to fx). I shoot weddings too, so from my experience if you shoot outdoor wedding you dont need advance dslr like d7000 for get the job done (im talking with your budget situation) but while shooting indoor when lighting could be compromise,that’s when you need advance dslr (or full frame). I usually use high ISO (up to 1600) while shooting indoor and d7000 or more advance dslr could deliver proper “clean ” image from noise in that ISO. AF in d7000 also faster and easy to use. From options that you have there I recommend you to got d7000. If you have tight budget for AF-S lens, you could use AF-D lens in d7000 and AF will still work from autofocus motor in D7000 body. D7000 with af-s 35mm 1,8 or af-s 50mm 1,8 wont let you down and give a superb results while used properly. Both are very cheap lens. Just like Nasim’s review af-s 50 1,8 is sharper than it’s pricy brother af-s 50 1,4 but you lost 1 stop and more creamy bokeh (doesnt matter for me,i use flash anyway). and finally,the best thing i could say is borrow or rent all options you have and compare it yourself. I always do that before having a new gear. i dont think micro 105 is proper lens for shooting wedding with crop censor. i had this lens. it’s DoF very shallow and could deliver every detail in subject’s face like pimples or things. Except you want to shoot candid from far away, i dont recommend 105 macro for wedding especially indoor wedding where place to move is limited. with this lens,you need to have 5m distances just to get full headshot. im using 16-85 for everyday photography,just like reviews said that 16-85 is the “sharpest” kit lens between 18-55, 18-105, and 18-200. I’ve used all these kits. Sad thing is it’s not that sharp like I want to. I sold my 18-200 to got this. the sharpness is nothing compare to fix prime or wide angle lens, it’s just sharp enough to walkaround but not in special purpose lens especially when you got paid for what you shoot. When tech is available for faster contrast detection(Our compact and mirror less cameras are the living proof of it), why is it that contrast detection is painfully slow in DSLR’s Live View ? This seems like a deliberate attempt to create market segmentation to me.. This question is driving me nuts. this is Kavan writing…simple question about autofocus…How does the autofocus system decide which object or subject in the scene it needs to focus on? What criterion does the AF system use to select the subject? Great article…going to print it and study it in greater detail. Quick question. I have a D3100 which has 11 Focus points. I still haven’t completely understood why that is required. Wouldn’t it be easier to just use the center focus point, aim that focus point where you want the subject to be focused, half click to focus and then re-frame the shot to however you want? I guess my question is when would there be a situation where a photographer “really has to” choose a focus point other than the center one? Hola,Nasim no se si es tarde por que veo que las fechas de estas preguntas son de ace un año,pero no queria dejar pasar la ocasion para darle las gracias,tropece de casualidad con esta pagina y le puedo decir que e leido muchas de fotografia pero tan claras y bien explicadas no, es la mejor ,enhorabuena y gracias sus explicaciones son claras y de mucha ayuda,mis dudas si me lo permite es sobre el funcionamiento del ,lai viu,como acer para tener buen enfoque y componer gravando los videos,con D-300,S gracias y un saludo desde ESPAÑA…. Thanks for an excellent article, Nasim. There was only one questions which I didn’t find answered. On the Nikon D800 you can set the general focuspoints to either 51 or 11. I wonder what is the better setting and why? What would you use for shooting airshows with a D7000, 300mm f2.8 and a 400mm f2.8? I would think AF-C,Dynamic, 21. But what about aperture priority or shutter priority, iso, raw or jpeg? I have to be honest and just say “simply superb”. Clearly written In “real english” leaving no room for misunderstanding. I have read many specialist books, I just wish the clarity had been as good. Anyway Nasim, enough superlatives I think this piece of work is terrific. Thank you. Thanks a ton.I read it ones will read it again. 1) In the chart above it implies that if you set the AF Area mode (back of camera) to Dynamic (or if you use Dynamic with 3D tracking) the AF-S focus mode (front of camera) is disabled. Trying to get my head round this. I’m trying to work out what gets ‘disabled’ and why? As an example, if you select Dynamic Area AF Area Mode, from the chart it looks like the AF-S mode is disabled? Surely whether the camera focuses a single time or continuously is not a feature that gets disabled because of an AF Area mode you have selected? I use this because if the model is still and posed a press of the AF-ON acts like single focus mode and the shot can be taken. If the models are moving, holding the AF-ON will have the camera track them. This was extremely helpful! Thank you so much :) I’m going to favorite your site and come back again for sure…wonderful work you create! Thank you thank you thank you for this article! I read the manual for my nikon d3100 over and over again, but did not understand focusing until I found your article. This is the best article on tje subject I’ve ever read. Thanks again. Brilliant article Nasim! You have explained almost everything possible under the sun! Thank you so much! I tried looking for articles on your website which taught about the ‘AF-on’ button (I use Nikon-D3100) but couldn’t find one. Could you please write one on this topic? Or, if you have already written one, could you please provide me the link? After 40 years of photographing wildlife, my eyes are not as sharp as they once were. My images are becoming increasingly disappointing. As it’s time for a new camera, could you please tell me which manufacturer (you think) offers the most accurate and fastest autofocus system. Photo shops just praise the models they are trying to sell. I need a more balanced, honest opinion. At the moment I’m looking at maybe the Nikon D800. thank you for this article. it is the most comprehensive and easy to understand article on this topic…ever written! i love your flow chart; really helpful. when using af-c dynamic or 3d, do you keep your camera still once focus is locked or do you actually move your camera with the subject and it keeps up with the subject. i’m sure that’s a silly question, but when i was photographing my daughter running down a hill yesterday, i didn’t know if i was supposed to keep the camera still and let her run out of the frame or attempt to track her with the camera and the focus system moves with my movement. does that make sense? This article is very wonderful; staight to the point with great helpful tips. I’m a beginner and it already gives me confidence that I can take sharp pictures. I only have a couple of questions that I did not completely understand. I read the manual of my camera but I did not encounter such Active/Phasive Autofocus, as well as the Release+Focus. Base on my understanding, is AF-S is the only Active Autofocus? Since it uses the infrared to focus? Does the AF assist beam automatically switch off if I choose AF-C? Please elaborate/explain more about the the Release+Focus. Thank you in advance! I will continue to read more articles in this website because it is very helpful for me as a beginner. More power to you! I spend a lot of time photographing my two year old daughter, her cousins and birthday parties. I have been asked many times to do family photos for friends, and have also been asked to photograph a friends wedding this summer….but I am racked with nerves over it, because of my hangup with focus and achieving sharp photos. I have been consistantly unhappy with how many out of focus or soft photos I have been getting. It happens so often, that I’m starting to feel like its a fluke if I manage to get a sharp one. I’ve noticed that in an effort to compensate, I have been taking a lot of close up photos, framing faces. These end up giving me the sharpness I am looking for, but my photos are all face. If I take a photo at a distance from my subjects (even at a short distance, enough to just capture them from head to toe) almost always their eyes are out of focus. Part of it I have discovered is my love for the effect a wide open aperature on my 50 mm has, but 99% is my lack of understanding the focusing modes in my Nikon DSLR. I’ve known this for some time now, and have researched ways to fix my hangup, and until todays random search yet again, my questions have gone unanswered!! I’ve also on many many many an occassion had my camera seem to ‘freeze’ and not take a photo. I never understood why, and cursed my camera!! I’ve even asked two of my professors where I’ve taken a few photography courses, and never had my questions answered. Your article is awesome and is just what I was looking for! You spelled it out so well, and in a way that learning and absorbing the information was effortless!! I can’t wait to go home and change my focus modes, and chase my daughter down with the camera, and to finally have an understanding of what I’m changing them to and why! I’m new in the photography world and i found your articles very interesting and helpful. Thanks for sharing your knowledge. You did an excellent job explaining what can be a very confusing topic for some. It would be a lot less confusing if Canon were to adopt Nikon’s naming conventions. My question has to do with a statement you made in the first paragraph. I can understand how changing a photograph to B&W would hide white balance problems, but how does it hide focusing issues since all the tonality & contrast information would remain? Hello, I am Khurshed, from Mumbai, India. I have a Nikon D7000 with the standard 18 – 105 mm lens. Is it ok to leave the lens switch to A and focus button/lever to A while the camera mode is in M (the main mode dial). Can this damage the camera, if pictures taken in this mode? Please advise. Thank you. I understand the lens switch on “A” and camera mode in “M” but can you clarify what you mean by focus button / lever to “A”. I don’t have a D7000 so I might be missing something here but if you can let me know what the focus button/lever set to “A” does I might be able to help you. I see it now…I think you were talking about the “focus mode selector” towards the bottom front of the camera. Correct? If that’s the case, I don’t see any problem. Your lens switch is set to “Auto Focus”. Camera Mode set to “M” simply means manual exposure and has nothing to do with focus. Since your lens switch is set to “Auto Focus” (i.e. “A”), the focus mode selector switch should also be set to “AF”. Just make sure that you have selected the appropriate AF mode. Beautifully conveyed :)! Nice article! Thanks for this article – exactly what I was after. I recently got a body with the 3D-tracking option but I never really understood what it was doing so always went AF-C for wildlife. Now I know how it works and in which situations it might be most useful, I’ll experiment with it a bit. I have been following your site for some time now and I must say your articles and reviews are spot on. Your articles take very difficulty, confusing and sometimes complex photography information and explain it in a very simplified way. Thanks for sharing your knowledge of photography. Your article is the best on Autofocus. You can write a clear article on a complex subject. I add your article on my Website PHOTOPRATICO : sites.google.com/site/…atico/home. thanks for the great article. This was much easier to read and understand than the camera manual! Such a wonderful article wrote by you it’s help me lots. But, I have still little bit confusion regarding the focusing point. Mainly I am a Canon shooter & have 60D & 7D both cameras have all cross type focusing points 9 & 19 respectively. I have followed on the both cameras are capable to focus with extreme corner focus point (Left or Right) even with slow lens like f/3.5-5.6 with zoom end position. Recently I have tried my friends Nikon D300S with Nikkor 16-85mm f/3.5-5.6 ED VR . But, I am surprisingly followed that the camera is unable to focus with the extreme corner focus points at 85mm zoom position when the f number is 5.6 & at the same time with the 24-70 f/2.8 lens it’s focusing with out any hesitation. So, my question is it really necessary to put huge (51) focusing points except the 15 cross type in the middle. If it’s necessary then up to which F number the rest 36 focus points are sensitive. One of the most simple and informative article I ever read on Autofocus. I will make it a habit to go through your articles before taking clicks! CUSTOM AF C and AF S, focus and release plus focus. I don’t no where to find those setting in my Nilon5000. This is a well thought out and presented article on focusing higher end cameras. I have 3 books an my D700 and D7000 and you cleared up some issues that I have been struggling with on birds in motion and other dynamic focus settings when single point focus won’t do. Excellent article! Best explanation I have ever read. Thanks so much! Nice for conformation of what I already had. and a great reference. I will laminate pieces of this article and put in my camera pack. 1000 thanks for the article and your website!!!!!! Great article, I had been searching for a technique to get the focus right when shooting small group of people indoors, and this article ends emphasizing on how to use the camera in such situations. Thanks a lot !! Nasim, do you still respond to ancient articles? This article is excellent, and still relevant today. Can you revise it to include the new Group-Area AF? I am having difficulty understanding it’s use and application with my D810. Is it for moving subjects with predictable movements toward and away from the lens? When acquiring focus of a moving subject, am I supposed to try to keep the moving subject within the center of the Group AF crosshair, by constantly following them by moving the crosshair with the thumb dial? Or am I supposed to sort of pan the camera hand held, and try to maintain the subject in crosshair that way. Or am I supposed to be stationary, waiting for the subject to move into the crosshair? I’m probably way off base either way. I have not been able to find any suitable literature online regarding Group-Area AF. I’d appreciate any advice you can offer. I’m converting this article to PDF to keep on my iPad and iPhone as a reference. I must say, I can’t thank you enough for the knowledge you and your staff have provided over the years, and the frequent responsive communication you maintain with your audience. It’s invaluable and shows that photography is not just your work, but your passion. super article…really all things be clear now obviously am a bigner its for enough to clear handing a dslr. Excellent Tech. reading on AF for me . Nasim , the new Group – AF feature in D4s and in the new D750 , does that make a big difference while compared with Nikon D4 Dynamic AF ( 9 or 21) while photographing birds in flight on a sunny day . Wanted to thank you for a great article. For several years, I have been an enthusiastic armature with a tech background who buys more expensive equipment then my skills deserve. I’ve read many articles and always found something lacking. This is the most comprehensive post I have evern seen that is backed up with real world examples. Its great that you keep it updated and its doing wonders for your SEO as the articles comes up immediately on google. Hello, I write from Patagonia Argentina. I wanted to thank you for such a good explanation on this topic, Focus Mode, I own a Nikon D7100. Thank you very much. Excellent article Nasim!!!! I’ve been trying to explain this to my scientist wife, who has a great eye, but has a hard time understanding my technical explanations about how a camera works. I’m just going to forward her this article!!!! Ahhhh, marital bliss again….Thanks!!!!! One thing however: you recommend to use AF-S mode on people. The new group focus mode has the face detection enabled, so it is a pretty good common ground between full-auto and one-point, especially for taking people pictures. You roughly select the face area (so it doesn’t wander around like in auto mode sometimes), and the face detection will catch the eye. This article is incredible. I just went from a d300 to a d750. The nikon manual is rather poor at explaining the focus options but your article is great! Thank you for your useful article…and I’ve joined to learn more…. I am a beginner, a quick learner, but none the less a beginner. I use a Sony A6000. I have always feel embarrassed to use the autofocus. I have always had the impression since I was young that “real” photographers manually focus, but for some reason it is the one and only camera setting/function that I am so uncomfortable with. I already have some small issues with the steadiness of how I hold the camera that I am afraid to add the risk of increased softness that I may create by manually focusing. I have found the function that highlights areas in a color of my choosing (I chose white) in the viewfinder/LCD when manually focusing, but I fail to understand how it works. It seems like it only highlights edges that are in focus, but it is rarely an edge that I am trying to capture in a picture. I notice when using the 16-50mm kit lens that in manually focus the image temporarily zooms in to assist me with focusing on a specific point, then goes back to full scene when I stop turning the focus ring. This may be due to a setting I enabled (like focus assist or something), not sure. It is somewhat helpful too. I guess practice makes perfect. Excellent compendium of autofocus. Thank you Nasim. I have a practical question. My problem is actually to get sharp an eye of my subject as animal or person. I don’t understand the profit of 40 or 50 autofocus points and discussion about it. If an eye of a subject is not sharp and instead the tree behind is sharp I have to delete the picture anyway because of low quality. So I don’t know how to use the 40 autofocus points and control them. Face recognition is another question what part of face nose or eye? I’ll give you my perspective, but i’m no expert. i NEVER let the camera pick the focus point. For most situations, i use the center-focus point: Lock the focus on the subject, then recompose the picture. The only time i use the multi-focus points are: 1. if camera is on a tripod, i use the focus points to get the proper part of the picture in focus (but I pick the focus point, not the camera). 2. if the subject is dynamic and moving, i will use a dynamic focus mode. In this mode I pick the focus point and let the camera adjust the focus point to keep the intended subject in focus. My name is Xindy, from Malaysia. I am currently using a Nikon D750 camera. I’m experiencing some difficulty taking sharp images when it comes to snapping people on long table. I take the shots from the front of the table to the back, thus producing a sharp foreground and blur background (***Please refer to attached photo). I use autofocus function. Is there any method to solve this? Desperately need a solution as I’m taking a lot of event photos which involves using long tables. Xindy, what aperture did you use? Seems like a wide aperture, try something between 5.6 and 8, with your sutter speed around 60. You will need a speedlight on your camera. The problem is not so much the point of focus as it is the depth of field (abbr DOF; which is what Paulo is suggesting). The exact DOF varies with the focal length of the lens and the f-stop: wider lenses and larger f-stops have greater DOF, leading to better sharpness from front to back. To keep it simple (to avoid hyper-focal distances, etc), focus on the front faces and choose an f-stop of 8 (or maybe 11, depending on how far back you want the focus to extend). The trade-off with smaller f-stops like f8 or f11, is that less light reaches the sensor, and longer shutter speeds are required (or greater ISO settings). You probably want to keep the shutter speed fast (to minimize subject (and your) movement, so increase the ISO (if you have a image-stabilized lens, this will reduce your movement but not that of your subjects). The exact settings will depend on how dark the surroundings are. Probably acceptable results would be f8 with an ISO of 3200, and again focus on the subjects at the front (which are in better light). If you are using flash, then the options are similar, but the shutter speed choices are a bit more complicated depending upon the ambient brightness and your flash. To solve this problem at a more sophisticated level would require a tripod, maybe external lighting or even a tilt/shift lens. Thanks a lot for clearly explain. Hi Nasim. Thanks so much for giving us detail information about auto focus. I just have a question about Scenario #5 and hopefully you could help me to answer. My camera is D7100. You’ve mentioned that the best way to shoot landscape is to select Single Point AF Area. But if I select Auto-Area AF Mode, the D7100 sometimes could get more than 20 focus points on the viewfinder. Does it mean it will capture more accurate picture than selecting Single Point AF? I understand that I have no control over focusing if I use Auto-Area AF Mode. But I always thought the more focus point showing in viewfinder means my subject will be captured in more detail. Hopefully you could solve my confusion. Thank you Nasim… best article I’ve seen on focusing as of yet. Can you recommend settings on a D750 for concert photography? Fantastic article! I get it now. Thanks! Thanks a lot for this information. Very well explained! I recently got my Nikon D7100 + 35mm 1.8 DX. Not only this article, but your other articles, too, are helping me a lot in getting familiar with the camera and the techniques. Thank you very much. Great article. Very helpful. You explain things very well and that are easy to understand! Just switched back to Nikon after years of shooting Canon. Just moved up to the D750. Just started photographing horses in motion up to a trot or at a race. Question. I must set my shutter speed at 1/500 and in shutter priority with AF on. What settings should I be using to get a shallow depth of field , f2.8, up to f 5.6. Presently I am getting f 16 and higher for outdoor shooting. What are your recommendations in setting up and getting a shallow depth of field. Your articles by the way are outstanding. Wish I had found your posts a few weeks ago. This is a great article and honestly has explained these modes more deeply and comprehensively than any other resource I’ve found, and it’s especially nice to have for reference later on. I do have a question, though, because I haven’t been able to find any sort of advice on this particular shooting situation. I do concert photography, and I’m still struggling to find settings that get me consistent results that keep me happy. I own a Nikon D610, at the moment, and usually shoot with a Nikkor 50mm f/1.8. My biggest issues are acquiring and keep focus, and exposure. Because musicians are always moving around on stage, along with the extremely low light in most situations, with extreme shadows and extreme highlights, and constantly changing lights and colors, it’s difficult to figure out settings that make it easy to track an energetic musician and keep them in focus without fretting too much about the lights destroying my photos. Advice? Excellent article Nasim !! Very easy to follow and as with most of your articles superbly explained. Thank you !! Thanks Great work, so easy to read just what I needed Just updated from a Nikon D7000 to a D810 so trying to get out of the Auto Lifestyle, and your articles have helped. Once again Thanks for all your hard work you have put into this. The speed of light is 3*10^8m/s. For the camera to detect a difference in distance of 1m (about 39 inches) it would have to be able to detect a difference in time of 1/(3*10^8seconds), or 0.0000000033seconds. Can a garden variety camera really do that? To get within 6 inches, it would have to detect a difference in time of about 0.0000000005 seconds. You’re talking somewhere between amazing and incredible, and I’m skeptical. A superbly written piece. Thank you for your expert opinions and advice. Great article!!! Very useful info. After 2 years of frustratingly not knowing how to actually use AF I finally get it. Amazingly written article. Thanks so much! I am very much appreciate your article. Some experience bird photographer said that AF-C with single focusing point is the best choice compares with group-area autofocus, because the the time need for computer running is faster and shorter. How do you see it? Thank you very much for this article. You are a great teacher for me. Thank you very much Mr.Nasim . You are a great teacher for me. Thank you very much Mr. Nasim . You are a great teacher for me. Many thanks for a great article and explanations. I’m a Canon shooter primarily and will continue to be so, but i’ve just picked up a D810 and a couple of lenses to cover long range stuff. This is the first article i’ve come across in a lot of searching that properly explains the different settings and phraseology, sufficiently clearly and concisely to help ease the transposition of settings between cameras. It’s a shame Nikon don’t get you to write their manual for them! Thanks a lot .. Mr. Nasim Mansurov…. You are a great teacher for me. Can Anyone help me to become a best photographer, i was a hobby photographer, once i read and searching in internet i got more amazing pictures from internet, so i would like to have more tips about photo graphy.. if you like to help me just please email to me… i am Johnson. What an awesome article. It meant the world to me. Hi! I was just directed to this article and it does help explain a lot to me but I still have one question that I’m not sure the article explains. How do I make the camera use the focus point that I want it to use? I skimmed through the article so if you did talk about it I missed it, but I would really like to be able to choose which focus point I want to focus with. A lot of times it focuses on something other than I want it to focus on and it is very frustrating.. Thanks for your help. Hello Vickie, sounds like you need to get out of automatic mode. Your camera decides what to focus on leaving you with zero control. Assuming you are a Nikon user, you will see this listed on Nasim’s lilac colored chart at the bottom. It is AF-A Mode. I highly suggest you read your camera manual which should explain the various settings/modes/buttons/dials. There are also some really good third party books out there pertaining to specific camera models that most times do a better job than the manufacturer. Also videos on YouTube! Finally, I suggest you take a hands on beginner photography class in your area. Hope this helps! 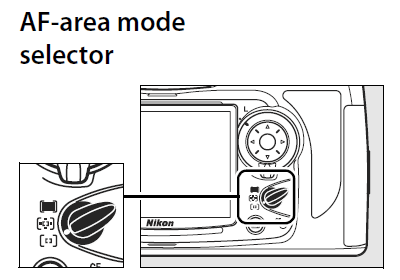 Correction, the mode I assume you are using if Nikon is Auto-Area AF Mode. Good luck! Hi Nassim…this website is super..I have learned a lot with you…thanks for all your effort. Very helpful article . could you please tell me , which focus mode should i use when i am on moving surface like speed boat . Imagine a photo writer who, five years after posting a tutorial, is no longer reading the compliments … yet we’re still writing them. Mr. Mansurov makes what no one else has done look easy. Why Nikon and Canon deprive customers of such clarity is out of focus to me. Thank you so much for this awesome article . I have the situation where I need to photograph children while they climbing swinging on ropes or tyers in an indoor gym. I have to be quite unobtrusive and no communication with them. So I can’t have flash or light beams from camera or flash because it would pull the focus on me and miss the moment of candidness. Its an old church hall with mixed lighting conditions (natural, neon, tungsten ) and not bright at all. I do this ones a year, for a full week, 4 hour a day. Lots of kids… I use the Nikon D810 with the 70-200 2.8 II with the battery grip. The settings Im using is Auto-Area AF Mode (hoping for face detection) with the AF-C mainly using 2.8, 3.2, 3.5 apertures with 250-400/sec auto ISO up to 4000. I manage to have always to have 1-3 spot on focused (on eyes) images but plenty of out of focus. Could you please advise a better setting with a better outcome? Thank you so much for writing this awesome article! Hello, quick question. I am going to have an in studio shoot with kids, some will be moving, some are not… What are you typical setting for the modeling shoots? ( for example I shoot on AP, CL, AF-C, 9 point focus). How many focus points do you usually pick? I used to have it on S and switched to 9 now) Also, for the even slowly moving subjects, why some still choose AF-S? Thank you for this awesome article about the direct applications of the DSLR Auto Focus System. I have had a very difficult time keeping my flowers in focus while shooting with my Nikon D750 on a windy day. My images are coming out blurred or partially blurred. This is absolutely an excellent illustration on how to understand the Auto Focus System… I will do some serious highlighting…Cheers! I have NikonD4 and I am very satisfied with the 3D tracking focus. It locks on and stay focused, even if it is the nearest eye. I can concentrate on compose the picture. This is a feature I really appreciate. But maybe I have to switch to Canon. Is the 3D focus tracking system on the 5D markIV as good as I am used to on my Nikon D4? I think this article is one of the best in this topic, very useful, and now I can experimenting more consusly with AF modes. A great thank you! I think this article is one of the best in this topic, very useful, and now I can experimenting more consciously with AF modes. A great thank you! This is really fentastic article. Recently I have been attend a photography class, in the class teach me about this sensor pattern type. But still I am confusing about this subject. Actually in the class told us choose horizontal line for horizontal subject and choose vertical focuse point for vertical subject. So it mean do I need to choose the focus point based on the subject? And cross moving subject choose for cross type patterns. So would you please explain more about this choosing focus point. I shot a night portrait without flash(natural light) with my Nikon d7100 (slow shutter ) but the photo came out to be a lot more red more than i expected. what would be the cause for this? Thank you for the excellent article. I’m now a bit further down the road in terms of how I’ve been using (and mis-using) my D5500 focus system. One situation that I don’t see addressed or may have overlooked in the other comments: When street shooting I often shoot ‘from the hip’. Literally. I’m blasting and hoping that the camera will focus on the biggest, closest subject in the field of view. With my D700 I’ve had great luck with getting the subjects I want in focus. However, I may be overthinking what setting to use, AF-C, 3D, the result of which is that I’m getting far fewer keepers. Any suggestions or comments? Note: I am typically moving as might be the subject I’m interested in. Hi Nasim – I just read the current article on BIF which lead me to your article on Auto Focus. I have a D7200 I and use Back Button Focus and have been using AF-C Single point, which I find challenging. I am trying to set it to AF-C with either 9 or 21 focus points. I can’t seem to follow your setting in scenario 4.4 BIF – I only see more than one focus point with the AF-A Auto or 3D settings. I never see the 9 or 21 points in the AF-C d9/21 for AF-A d9/21 settings. I don’t have a custom option of ‘Release+Focus’ for AF-C Priority /selection as suggested in your point #4 (mine are either / or, but not both – in any event neither seem to work with d9/21). when using the AF On (AE-L/AF-L) (BBF) what are the correct or best settings to use. AF C priority focus or release ? AF S priority focus or release ? I have read my manual and I have read the sections on autofocus, etc. but still cannot find out how do I pick which focus point I want to use? I have a NikonD7200. The article is excellent in nearly all respects but it does inaccurately state that there are Vertical and Cross-Type autofocus sensors on the Nikon cameras. The Nikon cameras have Horizontal and Cross-Type autofocus sensors. This is in the horizontal orientation of the camera. Easy to verify by holding the camera in a landscape mode position and focusing in low light on a picture frame and see on what sections, horizontal or vertical) the camera can focus on and on which sections it fails to focus. I just read your excellent article about Autofocus modes and found it extremely helpful. I take pictures on the weekend of running events in which I try to capture runners (Bib numbers) but the issue I’m having is too many pictures are out of focus. I have the Nikon D7200 and I set it for AFC with single point and use back button focus. My lenses are consumer grade (70-300mm 4.5-5.6 and 18-200mm 3.5-5.6) so they are not fast lenses like a 2.0 or 2.8. I thought with back button focus held continuously, the camera would focus and refocus as the runner gets close but it seems like I have to continually press and press for it to focus on the runner as they get closer. With the back button continually pressed, shouldn’t it continue to focus while pressed? Maybe I’m releasing the back button focus when I press the shutter release. Should I be continually holding the back button focus down while at the same pressing the shutter release or should I release the back button focus when I press the shutter release? Also, does it make a difference focusing on a runner straight on versus on an angle like a side view? Does the camera have a more difficult time acquiring focus if someone is coming straight on you versus a shot where you are focusing on someone as they run by you? Since there are many runners running side by side, I believe the Dynamic AF with 9 points would be best as the nine points could stay on the torso of one person versus 21 or 51 points. Would that be correct. Sorry for so many questions, but I need clarification and want to get more keepers. Thank you for any assistance you can provide. hold the back button focus down while pressing the shutter release at the same time. fire away in multi-shot mode and select the best pictures while editing. I recently graduated from photography and bought a D810 and I left my old camera D3300, but I did not know how to start, looking for some articles about how to use my new camera and found your website,I just read your excellent article about Autofocus modes and found it extremely helpfulI. This is a great, comprehensive article spoiled only by the introduction. “Some professionals often end up converting their images to black and white, to hide their focusing problems.” … I don’t know how turning an out-of-focus image into black-and-white will suddenly make it acceptable to be out of focus and I don’t know a single professional photographer who does this. Secondly, motion blur has nothing to do with focus … it’s an effect of shutter speed. A good motion blur image is always in focus. Other than that, interesting reading. I know this is a somewhat old article, though still very current and useful. The thing is, I had to stop reading to comment: your knowledge is very impressing, and it’s amazing how you explain everything so didactically. Every time I’m in doubt about something about photography I come here and quickly find the answer. I know I probably shouldn’t say this, but what Nasim says is the truth for me: D.
This is very informative but you do not touch at all on the option of “focus tracking lock on”. You are able to choose different amounts of lock on time before it tries to re focus. I was hoping to hear about why you would choose the faster options, vs the option to lock on for longer periods. Thank you so much , you have explained it so beautifully. I love your information. I do surf photography and just bought the Nikon D810. I could use advice on best settings to use on surfers in motion on the waves during morning light around sunrise. And also afternoon between 1pm to 4pm. ISO and AF. Just anything you can give me to get the best, cleanest and clearest shots. I seem to have a hang up on contrast in the afternoon. Exposure. Etc. Hi Nasim, your articles are so helpful. If these , specially tutorial type of articles could have been made available in downloadable PDF format , then it would really benefit more. Is that practically possible? As of now, I take screenshots with snipper tool & save in my hard disc so that I can read several times offline also. But doing so is really clumsy work. Hope you may do something to solve & help us ! In fact most of the articles here are so informative that a pdf downloadable version would be so useful. Thank you so much for this article which helped me understand better the Autofocus Modes and especially the AF-Area modes. Your article is written in a very easy to understand and simple way. I would like to ask you a question regarding the option of “AF-C Priority Selection: Release+Focus.” I am quite surprise that Nikon D750 (which I currently own one) does not have this option in the Custom Settings menu. One can only and must select either Release or Focus. There is no 3rd option for Release+Focus or an option on not to use either Release or Focus option . In the absence of the option of Release+Focus, what would you recommend for shooting birds in flight in autofocus mode AF-C since the camera is dictated by either Release or Focus option selected? Thank you. It is not depending on the af. But on the depth of field. Depth of field depends on the aperture, and the distance between You and the subject. You need to chose an instance who is about at the 1/3 distance between the closest and furthest kid/bird. Use apperture 8, 11. In this case you stand a chance. Other solution, is use wide angle lens with closed down apperture. Street photographers has a technique. They set the focus manualy around the distance the object will be most likely, and set the aperture, so to give them a good puffer range. In that case you wont even need auto focus. Old lenses usually have scale what shows the depth of field on different apertures. (Lines from the comonly useed aperture values, and the picture is sharp between the lines. Look up any vintage lens on ebay, you will see on the pics what I am talking about.) The big catch, is basicaly kid photo is sport photo. So you need fast exposure. But because of the group you need small aperture too. So what you can do, is set camera to manual mode, preset aperture to 8/11, speed to at least 1/50, and change the iso to auto iso 1600. But an advice, for group photo, ask them to line up and stand still. It can not be a good photo, where 30kids are doing different things, and all sharp. The article as a whole is very good and helpful (except you keep calling AF-S “single area” when it’s actually single-servo) but the section “explaining” the difference between phase and contrast detection is … confused. Contrast detection (CD): say you’re trying to focus a bright point of light — a star. If it’s in focus you should get one very bright pixel in your image, surrounded by black pixels. Lots of contrast. If it’s out of focus the light is spread out in a fuzzy disc, brightest in the middle and fading to nothing as you move out. Then you have much less contrast (between the brightest pixel in the centre and the pixels surrounding it). Phase detection (PD) is (conceptually) more like the multiple images from a rangefinder: when it’s in focus you have a single point of light. When it’s not, you have two separated points. Now, the thing is that in PD the *amount* of separation tells you the *amount* you’re out of focus by. So the camera can tell the lens to refocus by a specific amount. “You’re focussing at 10m. Refocus to 7m. Now!” This is very fast. However, the advantage is that it’s the actual image data that’s being used – as opposed to the separate phase detector in PD. So, once the image is in focus, it *really* is in precise focus. However, if there’s any mismatch between the lengths of the light paths (via mirrors) to the phase detector and (directly) to the image sensor then the focus will always be slightly wrong. Also, if the camera tells the lens to refocus 3.00 m closer, but the lens only moves 2.99 m closer, then it’ll be out by a bit. In summary, PD is much faster, but potentially inaccurate while CD is slow but always precise. Wonderful article, however people should realise Nasim hasn’t responded for nearly 7 years, therefore he probably isn’t likely to at this stage. Nor is he likely to still read your comments. Thank you Nasim for such helpful, clear information that you have written in such a logical way. Having the technical information first, then explanation of the settings was great, but the summary table and scenarios at the end totally topped it off. I just kept thinking this gets better and better as I read! Thank you. Amazing article! Well done. Thank you. I do have a question…about how multiple focus points (whether group, or dynamic or 3D) relates to spot metering. My understanding is that when spot metering is in use, brightness of the scene is read from the precise area where the focus point is placed. I think it makes most sense to use spot metering in AF-S so that a very specific (single pint) part of the scene can be selected and used for gauging exposure. How does spot metering work when one of the focus area modes that utilises multiple focus points is in use? Is it possible to get an accurate spot meter reading in this situation? Thank you. I really cannot thank you enough for this! For some reason I have not been able to get my head around focus settings but his article has really helped. A question though if I may? When photographing children and toddlers – both individuals and groups- and working on the basis they rarely stand still – should I change mode to Dynamic or group (with AF-C) – thanks so much in advance. Holy Moly! Way better than a bevy of help manuals. Fantastic article, so clearly explained and easy to understand. I wish you would write the Nikon manuals for them. Well done and thank you. I have to quibble a bit about your explanation of “Active” AF. This really is mostly an obsolete technology from the days of film point and shoot cameras. What it would do is fire either an IR beam or ultrasonic “pulse” at the subject and measure the time that it took to return. The advantage of this system is that it works in any amount of light-even in total darkness-and also against any subject regardless of the amount of contrast. The biggest downside is that it is easily “tricked” if you have some sort of object between your subject and the AF sensor-the classic example is shooting through a window or even a screen. Also, often times the AF area is rather wide and the user doesn’t actually see what it is-it’s just assumed to be “somewhere” around the center of the frame. Also, active AF works at any distance from the closest possible focus distance on out to infinity(point an active AF camera at the moon and it will still focus). I don’t know of any digital camera, or at least probably not anything made in this century, that uses active AF-the first DSLRs used phase detect passive systems derived from the film SLRs on which they were based, while digital P&S cameras have used contrast detect pretty much from the start. Thank you very much for your detailed explanation and found your article very helpful for me. Appreciate your time and effort. When I checked my D7200, i was able to set AF-S Priority selection to “Focus” and have option only for Release or Focus for “AF-C Priority Selection: Release+Focus”. I could not set “Release+Focus” is that setting based on Camera? Excellent stuff – thank you very much. Reading the article I realised how surprisingly little I didn’t know, but all the information was so well structured that I feel like this article put all my randomly known facts into right places in my head, so now everything actually make sense! Absolutely brilliantly written info! Thank you!